The main appeal of these spots, particularly Palm Cove, Yorkeys Knob and Port Douglas, is that they offer a safe location for the kids to play, shady adjacent parkland, a few shops and restaurants to alleviate the boredom of certain members of your party, and an excellent chance for a good result when fished under the right conditions. Apart from being great for families, they are also accessible without the need for a boat, and hence make for a reasonably inexpensive day out that will keep everybody happy. The scenic Captain Cook Highway north from Cairns to Port Douglas also presents opportunities with pristine sandy beaches, punctuated by rocky headlands and boulder strewn points. 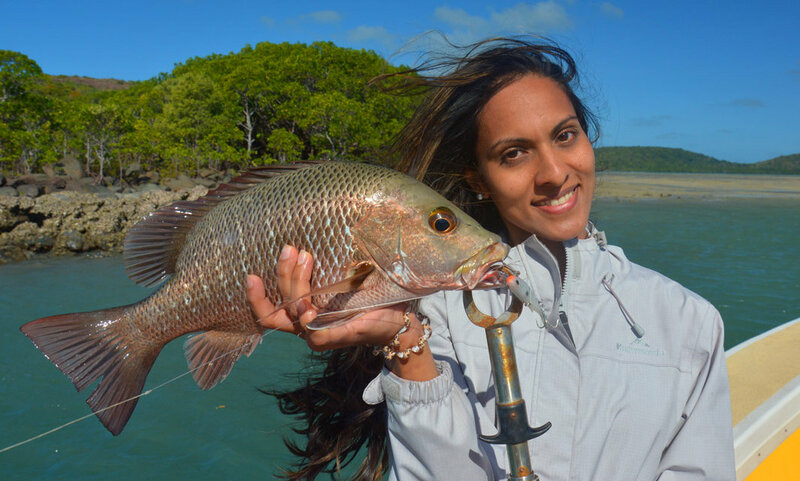 Although the beaches themselves along the highway are generally not very productive areas to fish, small Trevally, Catfish and Sharks can be caught, and the rocky headlands can be brilliant under specific conditions. The further you head north though, and the further you venture from civilisation, and the more important these areas become. Remote Cape York offers amazing opportunities under the right conditions. The heavy rains of the traditional “wet” season sees skittish baitfish, flushed from the rivers and creeks, congregate around the rocks seeking protection. Marauding silver streaks, from the highly prized Barramundi to Queenfish and Trevally, as well as Jacks and Fingermark, patrol these regions looking for easy pickings. These conditions are not for the faint hearted though – check out the information on the various Species Pages for the best way to tackle these prime summer targets. Similarly, the complete fly fishing story for these zones is comprehensively explained under our separate Fly Fishing section.